The third creative writing workshop in Kota Kinabalu was the smallest of the three, but that was to be expected, since it required, ideally, either a first person narrative or a short story from either the first or the second workshop sent in advance. Some, who had promised to attend, never got around to it, while others seemed under the impression that they had to attend one of the other workshops despite it being made clear in the announcements, that that was not the case. Ideally, it would be better, but if they had a story to submit, they would have benefited like all the others. In fact, there were a couple of new faces, guests brought by others who had no story. They just came along to learn. Several of the participants, at least six, did manage to attend all three workshops, including Tina Kisil, whose book Footprints in the Paddy Field had recently won second prize in the 2011 Popular-The Star Readers’ Choice Awards for nonfiction. This time she was trying her hand at fiction. During the workshop, I went over the bigger issues of each (so everyone else could benefit) by projecting their story on a white board and using a marker. An overhead projector would’ve worked better because every time we moved the text, the old markings got in the way, so there was a lot of erasing. Now we know (and now we know where to get an overhead in KK!) With the help of Jude, the organizer, we tried to minimize the movement between paragraphs (that some stories required). After asking the participants in advance, many agreed to have their stories sent around to the others so they would have a chance to read them before the workshop. That helped to make most of us familiar with the story, so I could concentrate on their problems such as generalizing too much at the beginning, or not starting close to the action, or going off on tangents, or creating needless confusion by jumbling dialogue or using pronouns with no clear antecedent. I kept stressing that if you anticipate that people are going to ask you questions while reading your story then you should answer the questions such as “Who is this character? Where is this story taking place? When did this happen in relationship to the other events?" By answering these 5-W questions before readers have a chance to ask, you’re not only making it easy on them but you’re also eliminating needless confusion. This allows the reader to get caught up in your story, in your characters, instead of pausing to scratch their heads. After going through all of the major issues for everyone’s benefit, we broke for tea, and then I gave another jumpstart topic “He/she kicked in the door,” which I brainstormed for them. While they worked on this and tried to produce a complete draft by the end of the workshop, I then met with each participant who had submitted their story, so we could discuss the rest of the editing that only concerned them. This way no one was wasting their time waiting for me; they were all busy writing. For many of them, meeting one on one was an eye opener; it probably felt like they were back in school, though I never experienced any teacher going over my story in such detail until years after I graduated and took a writing course! It’s not grammar mistakes that I’m pointing out, except when they were present; it was stylistic mistakes of using vague or wrong word choices, or trite expressions, or combining or separating sentences for effective­ness, or cutting out unnecessary words, or rearranging their sentences to increase clarity or effectiveness. Now and then all writers need to go through this. I know I sure did when I first set out to make myself a writer, and later even paid someone to rip up my already published Malaysian short stories so I could sell them overseas and produce a better collection of short stories as I did in Lovers and Strangers Revisited. Now I work with both published and unpublished writers as I blogged about earlier. At the end of the workshop the writers agreed to meet in the future to push each other in the right direction to improve their writing, something we all need now and then, a push to get started and another, often a bigger push, to keep your writing going. This is what I set out to achieve in my three creative writing workshops in Kota Kinabalu. *Here is a blog about the third workshop from one of the participants. It's always exciting (and scary) to get feedback so fast! I have my perception of how it went, but what really counts is how they saw it! (Looks like we even chose the same photos! Decided to add one more...) Yes, I agree, it can be embarrassing to have your mistakes pointed out but we're all making mistakes, and often the very same mistakes, too! It's a good way for everyone to learn. Here's another blog from another participant. **Here's my workshop with Malaysian Nurses Association. Another with International Tuition School in Kuching. ***Announcement latest workshops: Writing Your Life Stories Workshop—Kuching! 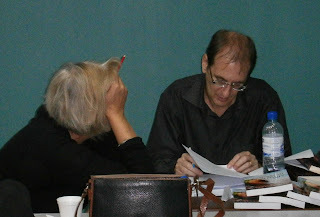 23 June 2012 (with links to other workshops and writing tips!) and also a workshop in KK on 17 June 2012! You're welcome. I'm glad it worked out. It's that feedback (often embarrassing) on our own work that we need to take us to the next level. You're right, none of my teachers ever went through my writing the way you did. A cousin of mine is also interested in writing. I will ask her to come along in the next workshop. They don't do it because it takes far too much time! An hour per three pages (after going over them a couple of times) or longer. I did it for 13 years for my writing students at Unimas and USM. The weaker students were at a loss. Every sentence it seemed contained at least one error. The good students, after they got over the initial shock of seeing how many mistakes they had been making, really appreciated it. Their writing vastly improved because they started to put more effort into it, draft after draft, and it really showed. They ended up getting an A. Some abruptly changed their major from science and become writers for newspapers or magazines or even editors.